Ancnoc (pronounced a-nock) is a distillery located in the Highlands region of Scotland. In this post malt Mileage reviews the Ancnoc 12 year old. The nose presents with malt, barley, green apples, wax candles, hints of vanilla, raisin, toasted coconut and spices. On the palate the entry is smooth and sweet, and progressively gets more interesting with shades of caramel, vanilla, honey, cereal, cocoa, coffee, fresh sliced apricot and a hue to malty barley. That maltiness proceeds to the finish, with flecks of barley and a bitterness similar to dark chocolate that reduces into citrus and the aftertaste of Earl Grey with faint caramels counteracting the tannins. 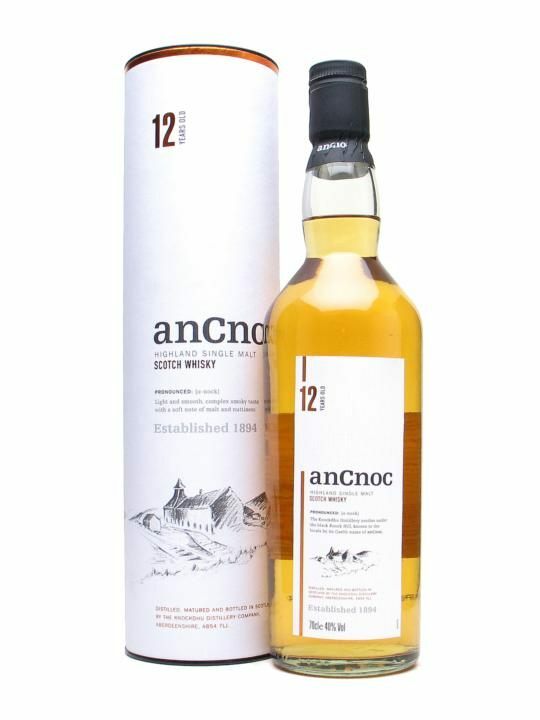 Overall, Ancnoc 12 year old is an interesting whisky that appears to have retained a lot of youthful character and barley notes, while at the same time it projects a fair amount of oak influence that adds to its character and smoothes out most rough edges. I would recommend this whisky for those who enjoy firm barley and cereal notes amidst hints of soft fruit, honey, mocha and a bit of wood inspired bitterness in the form of cocoa and spice on the finish. This entry was posted in Highlands and tagged Ancnoc, Scotch, single malt, whisky. Bookmark the permalink.